Like several Suffolk villages, Linstead Magna has shrunk dramatically. Its church, St Peter, has completely disappeared, and is perhaps the best documented of all Suffolk church disappearances. Suffolk is not short of ruined churches, but many of them date their ruination back to the 18th century decline in Anglican practice. St Peter, however, was still in use as a parish church into the 20th century. At that time, the Magna parish was already combined with its Parva sister, the larger village, and St Peter was used just occasionally, but especially for baptisms and funerals. By 1924, the church had fallen completely into disuse, and the roof was removed. Literally, St Peter was derelicted. The fittings and furnishings were removed. Some splendid benches were taken to St Margaret, Linstead Parva. The bell, and supposedly the font, are now in St Augustine, Ipswich, although there is some doubt about the font. The former font from St Peter may, in fact, be the font now at St Margaret. Why? Simply, because the font at Linstead Parva is an 8-sided font, with one of the sides left blank. This suggests that, like so many early Suffolk fonts, it was originally placed against a pillar in the north aisle. But St Margaret, Linstead Parva, is a pillarless church. 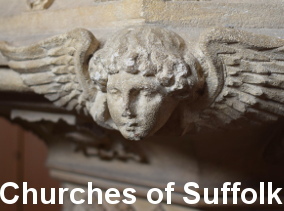 However, Munro Cautley, the diocesan architect who built St Augustine, claims that the font from St Peter is in Ipswich. His book was published just ten years after the demolition, so perhaps he should know. 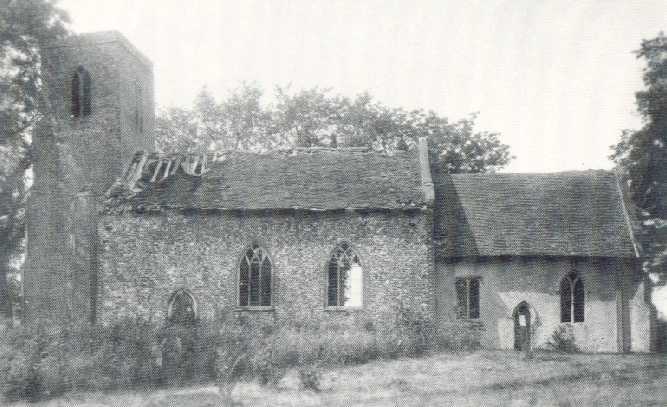 The church in 1924, shortly before complete dereliction. The brick west tower and the south east corner of the nave survived until 1964, when the owner of the land bulldozed them, and ploughed the rubble under. All that remained were the gravestones, flung into a ditch. These were rescued in 1980, and propped against the west wall of Linstead Parva church.I tried to locate the site of St Peter, Linstead Magna, in the summer of 1999. It was 35 years since the final destruction, 75 years since dereliction. And yet, I had recently met someone who claimed to have attended a service in the church shortly before the first world war. There might, I thought, be some trace. I knew the os reference for the church. This led me down a narrow winding byroad between Cookley and Cratfield. Just beyond Linstead Hall, an asphalt drove-road led me through the fields until I came to a pair of small 19th century cottages. To my excitement, I discovered that they were called Church Farm Cottages. According to my map, the church was formerly about 100 yards along the path from here to Magna Farm. But this path has now completely disappeared, and in any case the enclosed garden of the right-hand cottage appeared to cover it. I was conscious that I was not actually on a public right of way, so I continued along the asphalt path towards what I discovered to be Church Farm. At this point, about a mile from the Cratfield Road, a public footpath crosses the drove road. It led off east, across an undisturbed field of barley. Obviously, nobody had used the footpath this year. But according to my calculations, if one was to follow this footpath, one would be on the site of St Peter at the point where it turned sharply left onto the old Magna Farm pathway, just before the electricity pylon. Gravestones from Linstead Magna, rescued from a ditch in 1980. They can be found against the tower wall at Linstead Parva. St Peter, Linstead Magna, in the Summer of 1999. 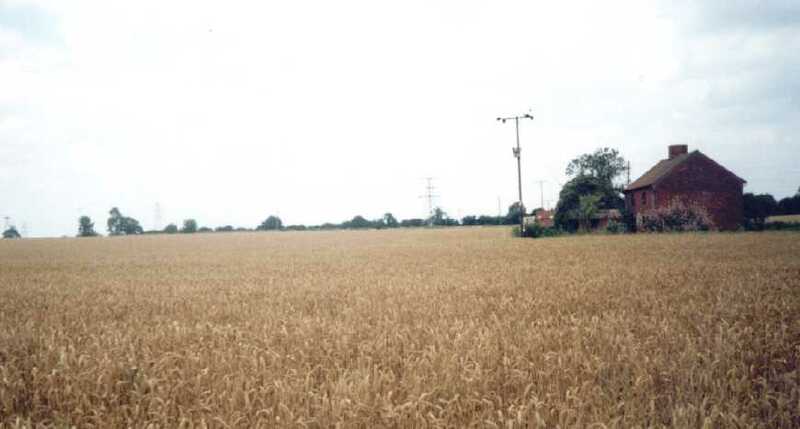 The church was located in the middle of this picture, about 100 yards away towards the electricity pylon, just beyond and to the left of Church Farm Cottages.